The Easy Flow Gravity Hopper System is an advanced designed bin for greater capacity in sorting and organizing general garage items like hardware and mechanical parts, small gardening equipment items, and offers many other uses to make the garage a cleaner, neater environment. The custom designed rack allows for greater capacity in sorting and organizing around the garage and helps to keep work areas free from potential tripping hazards while protecting stored items from damage. Unique Rack and Hopper design provides exceptional storage for a variety of items in the garage or around the home. 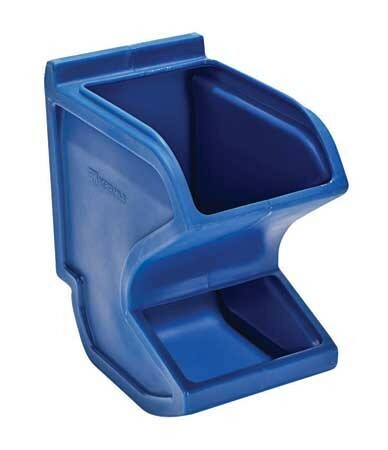 Hopper Bins offer plenty of saved space with its compact angled top design. Hopper Bins are rotational-molded for strength and durability. Hopper Bins come in two (2) color options: Blue and Red (sold separately). The sturdy Hopper Rack (sold separately) is made from 13-gauge steel and offers adjustable rail heights. Hopper Rack can hold 3-6 bins per side (12 Hopper Bins maximum). Rack and Bins can hold up to 900lbs, while the Gravity Hopper Bins alone hold up to 75lbs. The Gravity Hopper Rack is sold separately.